Wide Arches, Arch / Fender Flare Kit for 2006-2016 Toyota Hilux mk6 / VIGO - Welcome to Oilybits U.K.
Black Fireglass Arch Flare Kit for 2006-2016 Toyota Hilux D/Cab. 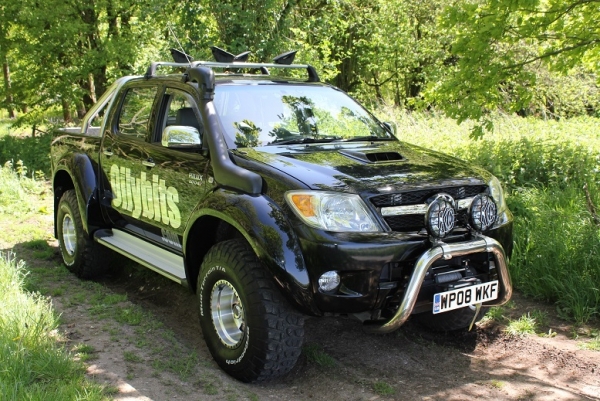 As standard the front fenders will fit snugly against the bumpers as used on 2006-2008 Hilux, models from 09-16 have a variety of bumpers and the fender will need to be trimmed and filled to fit snugly. As standard there is a reinforced aperture for a snorkel, this can be meshed over and filled by your bodyshop if you are not using a snorkel, but it is supplied with the aperture because it is also reinforced to give the fender strength, and it is much easier to fill the aperture than cut and reinforce an aperture if it were supplied without. The snorkel that will fit is a Safari Snorkel or any Chinese Snorkel of the same pattern, minor adjustments may be necessary with other styles of snorkel. Modifying a Hilux to 35" tyres give the trucks operator a much higher view point, approximately 6" higher than standard (3" suspension lift, 3" tyre radius), and also makes the vehicle 220mm wider (rim face to rim face measurement, tyre wall bulge is on top of this). The look is unbeatable and there is no standard 4*4 on the UK roads that sits taller and wider. With extensive modification to bodywork, this kit enables the fitment of -49 Offset Wheels and 35*12.5 Tyres for that unbeatable Arctic look. Kit is supplied in raw unfinished black fibreglass finish. This could be used in its natural state for offroad use, or skimmed, flattened and painted to perfection. To paint, the kit will require substantial preparation work by a bodshop before painting, to flatten and fill, and to make perfect the fit against your vehicle, we estimate the preparation work to be in the order of 6 hours work - this is the time spent preparing the kit shown in the images in this listing. Unfinished fibreglass mouldings are characteristically imperfect, they have bubbles, holes, exposed cloth and other blemishes, and these are very large components of 1.2m in length, hence the time required for preparation. The modification to the wings on the vehicle will result in every vehicles surface profile being slightly different, which is another preparation factor. Anyone without a creative eye and strong technical ability is not recommended to buy this kit nor attempt to modifiy their vehicle. To complete the modifciation to 35" you will need a lot of extra equipment which we just dont specialise in, all of this is listed in the blog page above and is readily available from 4*4 accessory specialists.